Admit it, resolutions are a cliche but we love ‘em. There’s so much to do and such less time, we feel ya. Being the happy little helpers that we always are, here’s a list of New Year resolutions for you - sprinkled with some fairy dust, of course. If you’re all about adventures, try water sports - we’ve got everything from surfing, ocean swimming, and kayaking, to scuba diving. 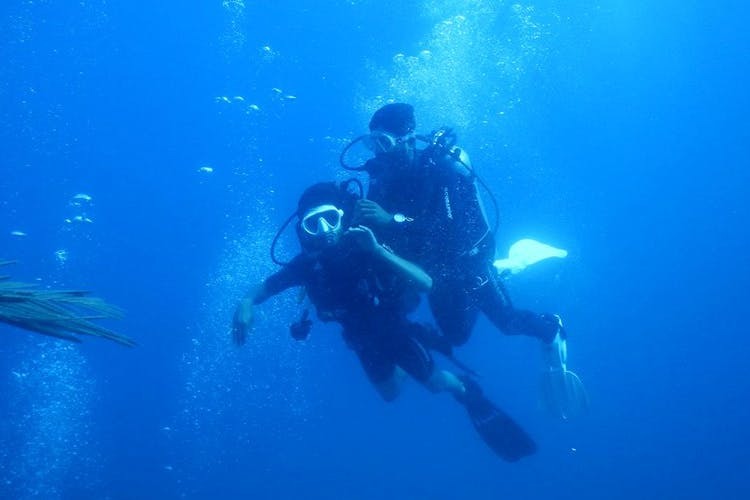 For scuba diving, you can check out Temple Adventures, Dive Chennai, and Salty Bone Divers. And for surfing and everything else, there’s Bay Of Life and Surf Turf. The expectation: you work out the whole of 2018. The reality: you missed out on 364 days and plan to start in 2019. We’ve all been there, so in addition to the gyms and functional fitness let’s explore off-beat ways to get fit. For a fun spin on Yoga, hit up Shakti Shilpa, who teaches Acro Yoga. For Zumba suggestions, click here. Want to take it up a few notches? Try slacklining, call up Easwar and get your sesh booked. Too broke for anything? Run free and wild at these parks in the city. Have you been to Pondy at least 30 times? This year, let’s try to travel more and also explore hidden destinations. There are so many beautiful cities that are underrated - Nagalapuram, for instance, is great for hiking and mountain climbing. There’s a beautiful waterfall and you can be amidst greenery filled with butterflies. For more off-beat destinations just five hours from Chennai, click here. Curate your own travel experiences with Wandermile, they know all the best secret travel destinations. Chennai is filled with libraries. Don’t believe us? Here’s the proof. There are several lending libraries that go back decades and there are roadside bookstores to check out too. Check into Rare Books, a quaint library operating out of a garage and Madras Literary Society, where you can adopt a book! With the upcoming plastic ban in Tamil Nadu and our love for the environment, let’s try to live a zero-waste, sustainable life. Brands like Everwards India are giving us a great head start with their lifestyle products - bamboo brushes, steel straws, up cycled bags, plantable pencil, and paper, etc. For eco-friendly fashion (on a budget, too) hit up these Chennai-based brands. Looking to declutter your home (and life)? Call kuppathotti.com to recycle everything from plastic to e-waste. Also, this Whatsapp group will help you donate gadgets and products to people who want them. There’s a lot many of us (born and bred Chennaiites) don’t know - for instance, did you know that you can get a drop-dead gorgeous panoramic view of the city from St. Thomas Mount? In 2019, let’s try and visit more quaint temples, churches, mosques, and heritage sites in and around Chennai. Mahabalipuram has a ton of historic sites, so check them out. Explore the culturally rich history of this city and fall in love a little bit more with Chennai every day. With so many entertainment hubs and restaurants coming up, few of us go to the beach. This year, try to catch the early sunrise and the marshmallow sunsets at the beaches around the city. Become part of running, yoga, bicycling, or surfing clubs for some amazing beachy mornings. If you’re into the arts, sketch, write a song, or shoot photos by the beach. Here's a list of less crowded beaches in Chennai. No year is complete without this resolution, or as Ellen says - be kind to one another. When you’ve got free time, volunteer for the community. Participate in clean ups organised by Environmentalist Foundation Of India. Donate unused items to charity organisations. Combine your love for pets and your helping nature to volunteer at the Blue Cross Of India or BMAD on weekends. If you just go that one extra mile, you’ll be bringing a smile to people and pugs. It’s like they say, you can’t be taught to be a Chennaite, you just learn. Indulge in more activities that will make you #FullyChennai. Watch more movies at Sathyam, open the lid of the Mexican Cheese seasoning and dunk it into your popcorn, run to the next floor to ask anna for extra butter, line up outside Sangeetha for fresh filter kaapi, ask ‘evlo?’ in a passive-aggressive tone to the auto anna. Madras is an emotion, and if you feel it - you’d better be damn lucky!